I’ve been doing The Project 333 for a month now. If you’re uncertain what Project 333 is, here’s the website. In short, it’s a minimalist wardrobe project, where you choose 33 items in your wardrobe (workout wear, underwear and sleepwear doesn’t count), and box the rest for three months. Then you assess what was worn and what wasn’t, and repeat the process. What I found was, despite boxing three plastic storage crates worth of clothes and donating 5 shopping bags of clothing, I only had one pair of jeans that fit. 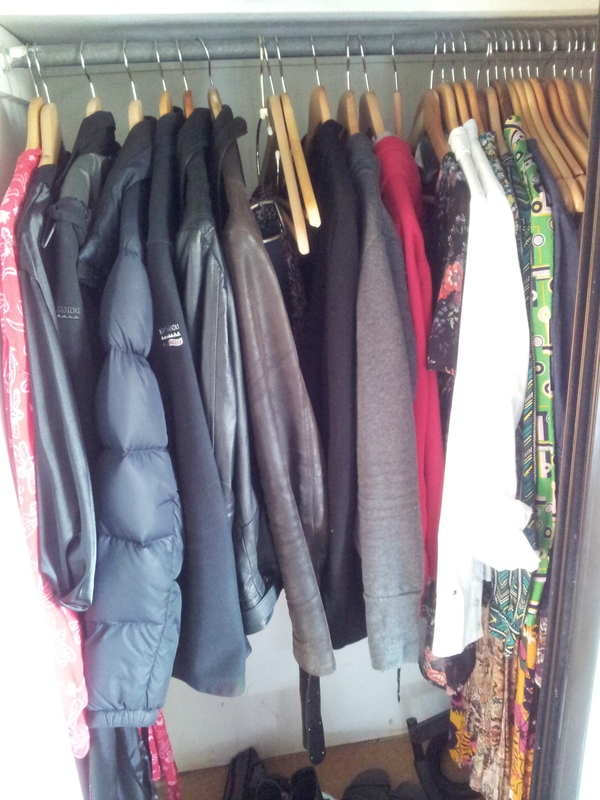 I also found I had lots and lots of clothes I simply never wear, despite planning to. And I had a small collection of clothes I wear over and over again. Clearing out everything except 33 items has been refreshing. Ironically, in a time that is supposed to be minimalist, I’ve gone and bought a few items because I found my 33 item spaces weren’t filled. I bought an absolutely beautiful brown men’s leather jacket secondhand, which is a real winner and looks terrific on me. I also bought a new wallet, and a couple of t-shirts to replace old, tatty ones I’d been wearing. I also bought a couple of long summer dresses – also vintage – because clearing the clutter could help me to see that I only had one decent dress for summer, which is coming on fast. My 33 piece wardrobe is just about complete, and I’m now dressing better than I ever was before. I’m happier too. Firstly, I’ve learned that I don’t need to buy anything for summer. I’m set 🙂 Normally I’d have gone out and bought a whole stack of new things, simply because it’s summer. Having a smaller wardrobe of items I love and wear has helped me to see I just don’t need anything else. If I choose to replace an item, that’s my decision. But I don’t need to. I’ve learned the true art of mix and match. Everything in my wardrobe goes with everything else. I feel great in everything I own. If I buy something and it doesn’t work for me, it goes out. Because I only have “space” for 33 items in my wardrobe, I’m a lot more selective about what I buy. So I’m buying carefully and cautiously and saving money. I’ve learned the art of resale. I have some beautiful items in my boxed clothing that I never wore. So I’m selling them. They’re mistakes, but I’ve accepted that, and will now recoup at least some of the money I spent on them. I’ve learned it’s okay to make mistakes. There are lots of other people doing The project 333, and some of them are blogging their experiences. Reading about their mistakes helped me to realise I’m not alone in having bought clothes I never wore. I’ve accepted that I wasted money. I made mistakes. That’s okay. I’m human. But now it’s time to clear the clutter and move on. I’ve learned my own sense of style, and that will guide me when it is time to buy any new items. By looking at what I actually wear and what I don’t, I can make better decisions when I buy new items or shop secondhand. This will help me avoid other costly mistakes in the future. Give Project 333 a go. You won’t regret it. A link to my Project 333 page on Pinterest: Project 333 goes vintage! Yep. The smaller size of a wardrobe really helps, doesn’t it! I was really surprised to find I needed jeans, for example, as I thought they were a staple item in my wardrobe. But this year I’ve put on so much weight – thanks to the stress of divorce – that nothing fitted me jeans-wise. The weight is coming back down to normal again very quickly, now everything is sorting itself out, but for a while I was stuck with tracksuit pants and even they were a stretch!